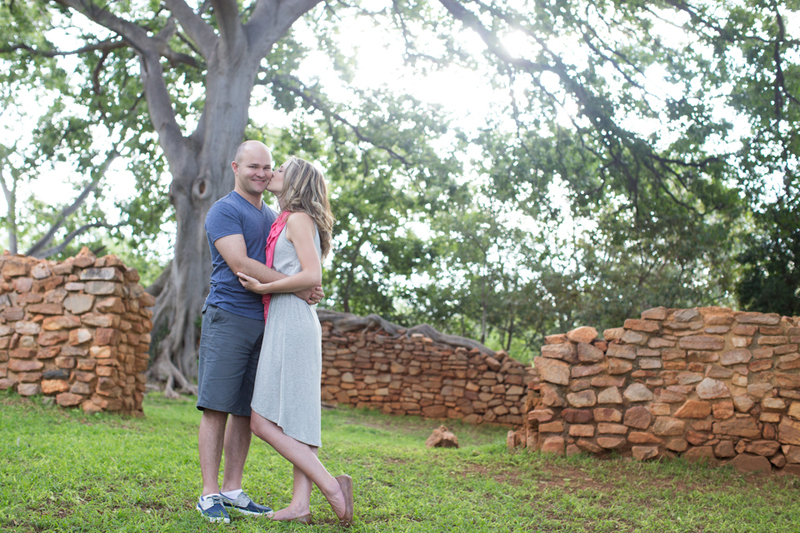 Hilgard & Nichelle are getting married next year in beautiful Clarens. 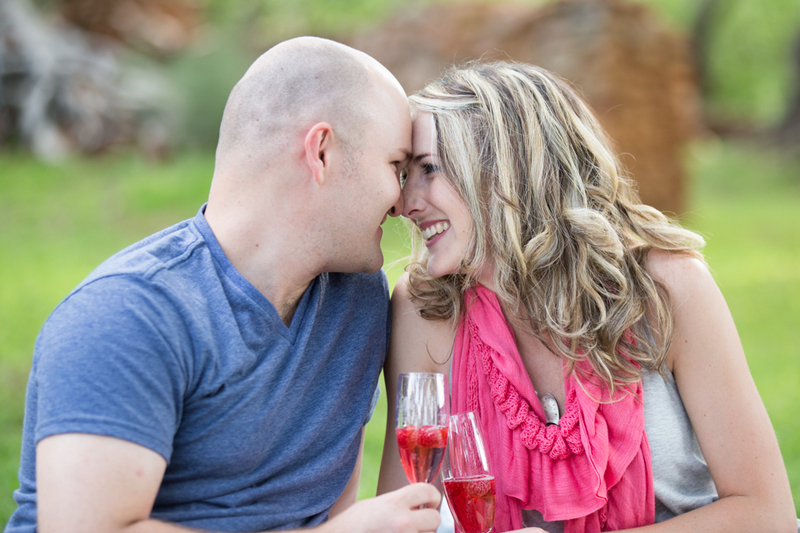 We took their engagement photos at Cussonia Crest's "Vygekraal". I LOVE these trees! 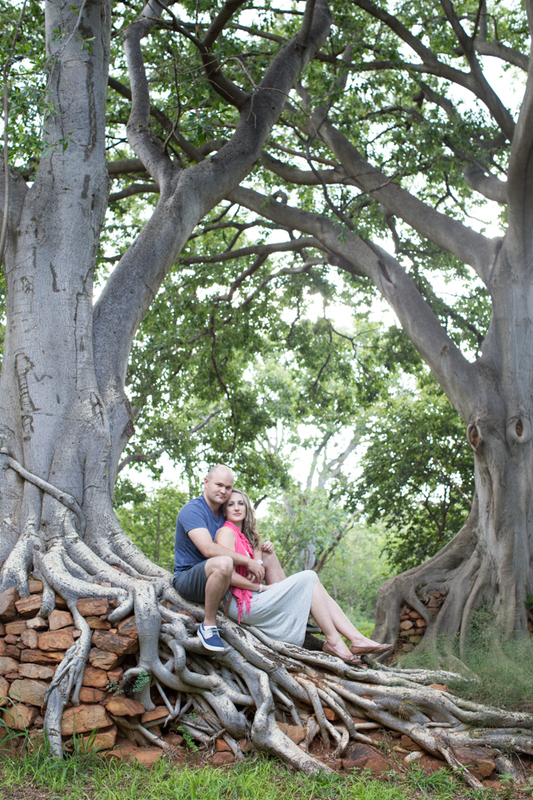 With their roots creeping over the stone walls it has an almost mystical feel to it :) Scroll down to read more of their story. 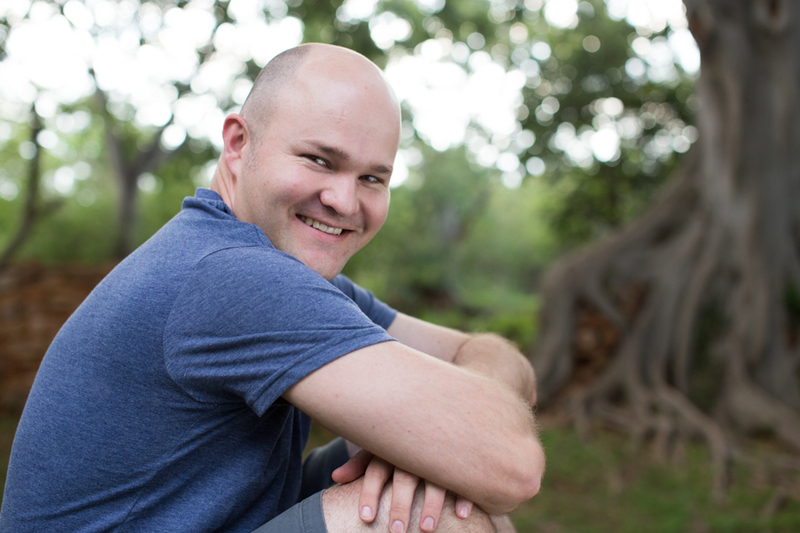 Hilgard & I met on a beautiful, bright summers day during February 2010… at work! It was my first official day of work after studying full time at university & the start of Hilgard’s final year as an articles clerk. Although he was very charming & funny right from the start, I did not see his attempts achieving much anytime soon (so no… not love at first sight). In fact, I was already dating someone else! But, I have to hand it to him, the man was persistent. He had me in stitches almost every day with his ‘wise cracks’ & jokes, never let me stand up to make coffee alone (he’d always find a reason to be in the kitchen as well), folded paper clips into hearts and attached them to anything of mine he could find & stole roses from the office gardens (more than once) to leave in my car door. Later that year when my relationship fizzled out, Hilgard & I remained good friends and finished our year at the same office. 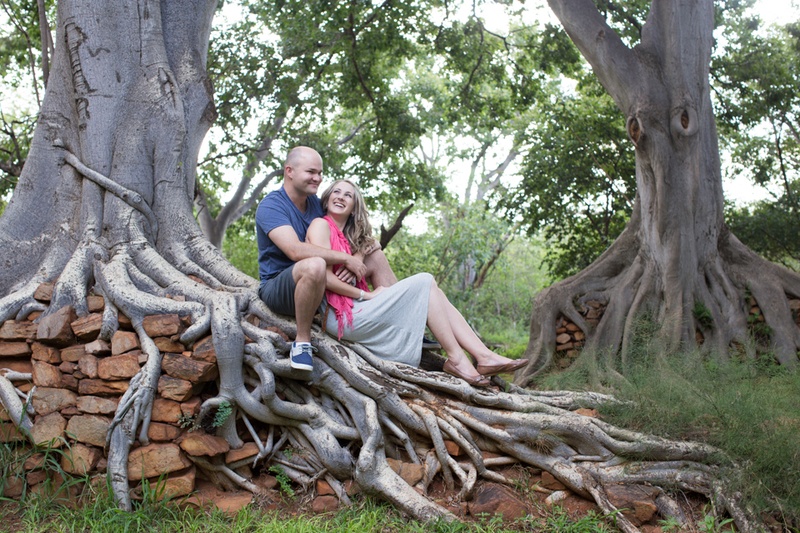 It was only on 26 March 2011, after we had both left the firm we worked for, that we started dating. We went out for sushi, a lovely starry evening, someone had lit a bunch of Chinese lanterns that were going up all over… breathtaking! Although very nervous, he took both my hands and asked me to be his girl. 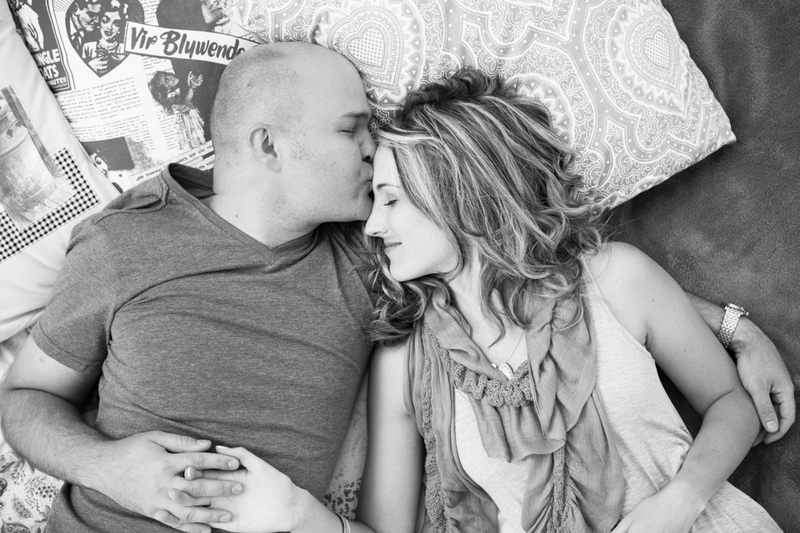 I could never have imagined that the funny ‘wise guy’ at the office would turn out to be the kind-hearted, gentle, strong, amazing man of God I have come to know, and the man I could spend my life with. It was Thursday 17 October. I woke up that morning with Black eyed peas’ tonight’s gonna be a good night in my head and told Nichélle that it’s a beautiful day and it is only going to get better. She thought I was crazy but little did she know what I have been planning meticulously the past 3 weeks. Knowing how good Nichélle knows me made it difficult to “hide” such a big surprise from her and I knew that I could not do anything out of the ordinary otherwise she would immediately suspect something’s up. I therefore went out of my way in picking up the ring from the jeweller, driving roads I don’t normally drive, wearing a chino to our date instead of my trusty old Jeans and reserving a table that should not be “reserved” when we arrive and even driving around to find the perfect spot to launch Chinese lanterns from which it could be seen at the restaurant. Arriving home after golf, and handing Nichélle a bunch of red roses, I quickly went to take a shower. We had a dinner date that night, carefully planned the previous week making her believe that she in fact suggested that we go to our favorite restaurant. Earlier the week I made a reservation but asked that the “reserved” card be removed from our table prior to our arrival because we never book a place at our favorite sushi restaurant. I dressed in chino’s instead of Jeans as it is quite impossible to hide a box with a ring inside in a Jean’s pocket without looking very suspicious. Arriving at the restaurant our table was still “reserved” but I insisted that we sit there. I hand-picked this spot after all two days before. We ordered wine and sushi and had a chat about the memories we had together. At around 7pm I asked my brother that they light the Chinese lanterns so that I can then claim that I actually did it this time (On our first date there were a sky full of lanterns which I also claimed but later had to admit that it was pure coincidence). I was constantly looking over Nichélle’s shoulder at the sky waiting with great anticipation for the lanterns to appear. She noticed and asked what I was looking at. Luckily the moon was almost full and the clouds made the prettiest picture in full moonlight. And that was what I was looking at... for the moment. About ten minutes later my brother texted me to say that the lanterns have all burnt out. 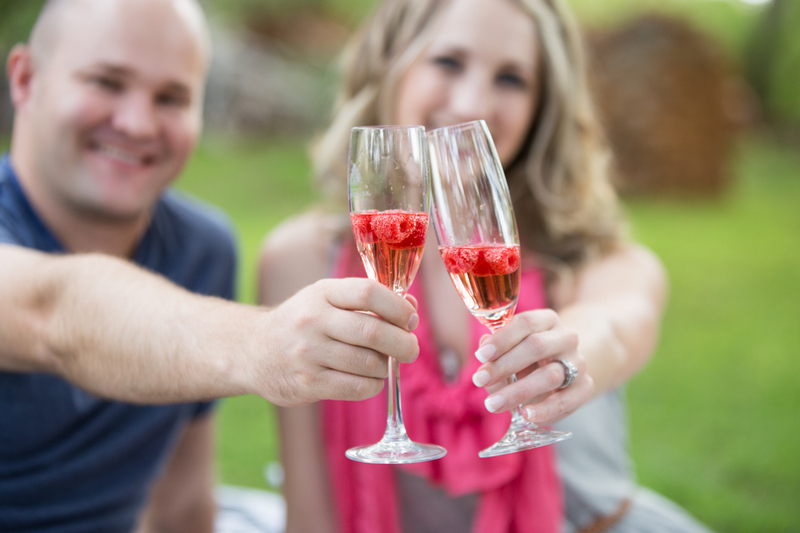 Although I was very disappointed, I decided that that will not put me off as a bunch of friends and bubbly were on its way to celebrate this occasion with us. I kept my cool whilst reminding her of all our good memories that we had and the ones to come and what a lucky man I am to have met her. Only when I got up to get the ring out of my pocket did she realise that I was about to propose. Through the tears and “you aren't serious, you aren't serious” she managed to nod her head a few times and I also believe that she said yes... although I am not too sure, but she is wearing the ring so I take that as a big YES! The people in the restaurant were cheering and clapping hands and we even got a few shouts from the restaurant next door. Our friends (and my team of helpers) joined afterwards and shared this special occasion with us.